The minute a flake of snow hits the ground as it did yesterday, I have to make soup. It’s like a reflex living in a cold climate. My mom’s favorite meal throughout her life was soup. 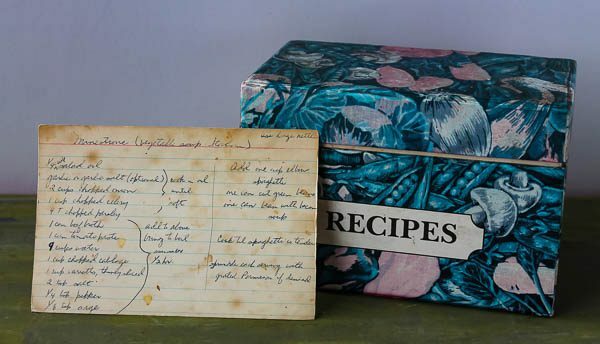 She loved this recipe for Minestrone that she found in the early 1960’s. 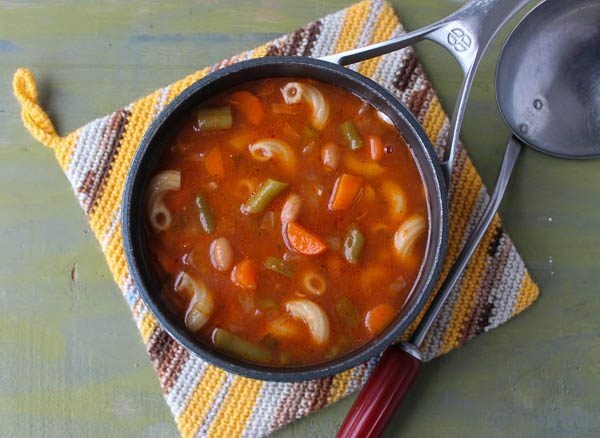 The recipe itself is recognizable as being from the early ’60’s as it uses a few canned products mixed in with all the fresh ingredients, and the elbow macaroni is called elbow spaghetti. The grocery aisles today have endless varieties of pasta, but fifty years or so ago you wouldn’t hear pasta, everything was spaghetti no matter what the shape, at least in our suburban area. The soup is easy to make and delicious. There is cabbage, celery, onion, parsley and carrots, along with the canned items of beef broth, sliced green beans, and a can of Bean with Bacon Soup that actually adds a nice touch of smokiness. It goes together quickly and dinner is ready in less than 45 minutes. I served it with some great French bread that my husband Bill and daughter Kristina picked up from a bakery in Chicago. Later tonight more snow and icy conditions are expected. What soup shall I make next? Heat oil in a large pot or Dutch oven. Sprinkle in some garlic salt, onion, celery, and parsley. Saute until vegetables have softened. Add the beef broth, tomato paste, water, cabbage, carrots, salt, pepper, and sage. Bring to a boil, reduce heat, and simmer gently for 30 minutes. Add the macaroni, green beans, and Bean with Bacon soup. Cook until the macaroni is just tender, about 8 minutes. Serve with some Parmesan sprinkled on top, if desired. I made minestrone last week. I love soups–just like your mom. Nothing better than a hot bowl of soup with some warm homemade rolls or bread this time of year–especially this year in Chicago. I love homemade bread or rolls with soup too. I’ve been meaning to try a Bradley Ogden recipe for dinner rolls with fresh herbs and now is the time. Watch for a future blog! This looks positively delicious! I make lots of soup in the winter. Hope you like it, Lori!